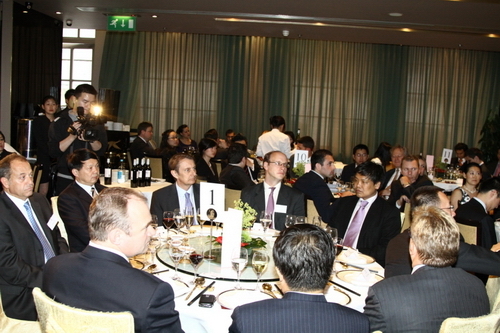 It gives me great pleasure to join you for the 2nd anniversary dinner of the 48 Group Club Young Icebreakers. The word "icebreaker" is clear and easy to understand both in Chinese and English. But when it comes to China-UK relations, the word carries profound implications and is associated with a memorable episode. 57 years ago, a group of British business leaders came to China despite Western blockade of the new-born People's Republic. They were subsequently known as the "icebreakers" for their bold endeavor to pursue business with China. More than half a century have passed since then and almost 40 years have passed since Stephen first visited China as a young man. But as a Chinese saying goes, "Clothes are valued for being new, and friends are valued for being old". I know you also have a similar saying in English that "Friends are like wine, the older the better". What heartens me even more is that the icebreakers' friendship with China has not only endured and got stronger, but has also been handed to a new generation, the young icebreakers. Just as Premier Wen Jiabao said of the young icebreakers during his visit to Britain early last year, "Young people are the future of our cooperation. What the young icebreakers stand for is a spirit of enduring friendship and cooperation between Britain and China and a force for good in promoting our comprehensive strategic partnership". Stephen's initiative of setting up the young icebreakers group two years ago was wise and far-sighted. Many of the young icebreakers have close ties with China and are committed to promoting cooperation between China and the UK in all fields. I have no doubt that China-UK relationship will be in good hands and will continue to flourish with people like the young icebreakers working hard for it. As the new Chinese Ambassador, maybe my day-to-day work is different from yours. But we all share a common mission. That is to advance the comprehensive strategic partnership between our two countries and to deepen the understanding and friendship between our two peoples. 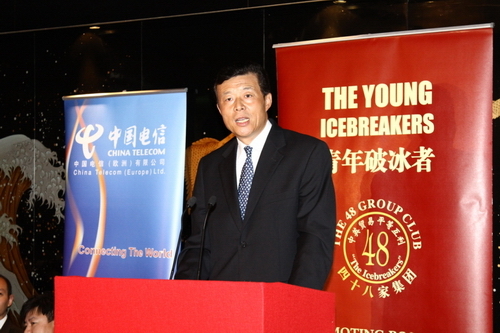 You, the young icebreakers, are also ambassadors for China-UK relations. I hope as the next generation you will understand the strategic importance of our relations. Both our two countries are permanent members of the UN Security Council and members of other important international organizations. One can hardly think of any major international issue that can be resolved without China and Britain. We have all the more responsibility to cooperate with each other in addressing global challenges. Secondly, we should work together to advance our cooperation in all areas. The China-UK relationship can develop best when it rests on a solid foundation of mutual interests. We need to work hard to identify more areas for cooperation in trade, investment, finance, culture, education, science, and people-to-people exchanges. Thirdly, we need to approach our differences with candour and respect. It is only natural that our two countries, different in social system, level of economic development, cultural heritage, do not see eye to eye on everything. What matters is to have more dialogue and properly settle differences as equal partners. The Young Icebreakers group is still in its infancy. But it has shown promise and vitality. I am confident that with your efforts, the 2 year old baby will grow up well and strong and shoulder ever more responsibilities for friendship and cooperation between China and the UK in the days and years to come.